For quantitative bioluminescent assay for ADP:ATP ratio (apoptosis) in cells. • Robust and amenable to HTS: Z’ factors of 0.5 and above are routinely observed in 96-well and 384-well plates. Can be readily automated on HTS liquid handling systems for processing thousands of samples per day. Changes in the ADP/ATP ratio have been used to differentiate modes of cell death and viability. Increased levels of ATP and decreased levels of ADP signify proliferating cells. Conversely, decreased levels of ATP and increased levels of ADP represent apoptotic or necrotic cells where the decrease in ATP and increase in ADP is much more pronounced in necrosis versus apoptosis. 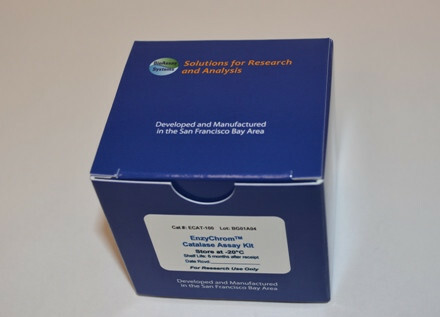 BioAssay Systems’ EnzyLight™ ADP/ATP Ratio Assay Kit provides a rapid method to measure ADP and ATP levels for the screening of apoptosis, necrosis and cell proliferation in mammalian cells. The assay involves two steps. In the first step, the working reagent lyses cells to release ATP and ADP. In the presence of luciferase, ATP immediately reacts with the Substrate D-luciferin to produce light. The light intensity is a direct measure of intracellular ATP concentration. In the second step, the ADP is converted to ATP through an enzyme reaction. This newly formed ATP then reacts with the D-luciferin as in the first step. This non-radioactive, homogeneous cell-based assay is performed in microplates. The reagent is compatible with all culture media and with all liquid handling systems for high-throughput screening applications in 96-well and 384-well plates. Applications For quantitative bioluminescent assay for ADP:ATP ratio (apoptosis) in cells. References Assay: ADP/ATP Ratio in Human cell (Pubmed). 2. Suhr ST et al (2010). Mitochondrial rejuvenation after induced pluripotency. PLoS One 5(11):e14095. Assay: ADP/ATP Ratio in Rat Brain tissue (Pubmed). 3. Sugimoto S et al (2009). Apyrase treatment prevents ischemia-reperfusion injury in rat lung isografts. J Thorac Cardiovasc Surg.138(3):752-9. Assay: ADP/ATP Ratio in Mouse cells (Pubmed). 4. Saito A, Castilho RF (2010). Inhibitory effects of adenine nucleotides on brain mitochondrial permeability transition. Neurochem Res. 35(11):1667-74. Assay: ADP/ATP Ratio in Mouse heart lysate (Pubmed). 5. Bekeredjian R, Suhr ST et al (2010). Conditional HIF-1alpha expression produces a reversible cardiomyopathy. PLoS One 5(7):e11693. Assay: ADP/ATP Ratio in Human cell line (Pubmed). 6. Schafer ZT et al (2009). Antioxidant and oncogene rescue of metabolic defects caused by loss of matrix attachment. Nature 461(7260):109-113. Assay: ADP/ATP Ratio in Rat lung tissue (Pubmed). 7. Chandak PG et al (2010). Efficient phagocytosis requires triacylglycerol hydrolysis by adipose triglyceride lipase. J Biol Chem. 285(26):20192-201. Assay: ADP/ATP Ratio in Rat Total ATP/ADP nucleotides in mitochondria (Pubmed). 8. Rink, C et al (2011). Oxygen-inducible glutamate oxaloacetate transaminase as protective switch transforming neurotoxic glutamate to metabolic fuel during acute ischemic stroke. Antioxid Redox Signal 14(10):1777-85. Assay: ADP/ATP Ratio in Mouse cell line (Pubmed). 9. Choi EM (2011). Glabridin protects osteoblastic MC3T3-E1 cells against antimycin A induced cytotoxicity. Chem Biol Interact. 193(1):71-8. Assay: ADP/ATP Ratio in Mouse cell line (Pubmed). 10. Choi EM (2011). Luteolin protects osteoblastic MC3T3-E1 cells from antimycin A-induced cytotoxicity through the improved mitochondrial function and activation of PI3K/Akt/CREB. Toxicol In Vitro. Assay: ADP/ATP Ratio in Rat bronchoalveolar fluid (Pubmed). 11. APYRASE THERAPY FOR BLEEDING CONDITIONS. WO/2011/088231 . Assay: ADP/ATP Ratio in Human cell (Pubmed). 1. Kwon DH et al (2012).Dietary protein restriction induces steatohepatitis and alters leptin/signal transducers and activators of transcription 3 signaling in lactating rats. J Nutr Biochem 23(7):791-9. Assay: ADP/ATP Ratio in Human cell (Pubmed).